Any individual who has some experience in the business world would tell you that, in today’s time trying to attain and maintain a proper status in the corporate jungle is not an easy task at all. Since getting a job in itself is such a tough task indeed, so many people are forced to stick with jobs they aren’t even happy doing. Of all the major issues which people in the business field face, one of the biggest issues is unemployment. The issue of unemployment is a very serious one indeed, which cannot be tackled easily. Here we are discussing about the different unemployment causes and effects. Unemployment indicates the total number of people in the staff who are willing to work but do not have a job. Number of people unemployed/total workforce. The staff is built by the people who want to work, it eliminates people who are disabled, retired and can be ability to work but not currently looking for a position. Example: People who are taking care of children or going to college. It is also known as search unemployment. This frictional unemployment is referred as the time lag between the jobs when an person is searching for a new job or is switching between the jobs. For what reason does frictional business exist? It would be more consistent for workers to with held their current jobs until the point that they find new ones. But frequently workers may change for different reasons before they can look for new jobs. Some may get marry and should move to their spouse’s job. Many of them take time off to care for family members.Some people might save money which is enough for them and they can quit unfulfilling jobs. They have got the richness to search untill they find the right and good opportunities. It is an unemployment which results if the overall demand for goods and services in an economy can’t support full employment. It takes place during periods of economic contraction or during the time of slow economic growth. Natural unemployment rate/current unemployment rate. This is a form of unemployment which is caused by the mismatch in the skills that workers in the economy can offer and the skills needed of workers by employers. Unemployment is an issue which does not exist in just one location. On the contrary it is a global phenomenon which affects a number of places across the globe. Even the most developed countries in the world have to deal with this issue. Unemployment is a problem which affects not just individual people but the financial and economic condition of a whole country. It is for this reason that countries try their best to have proper economic policies so that at no point in time do they find themselves in a problematic situation. Once you find yourself in financial trouble getting yourself out of it is no easy task at all. The work force is made up of those individuals who are able, capable and eagerly willing to work. The number of unemployed people in a location can be calculated simply by subtracting the number of people employed from the total work force of a place. The fewer the number of people employed, the larger is the number of people who are unemployed. Such unemployed people are those who are trying their best to get a job as soon as possible so that they will be able to maintain a good standard of living. Nowadays nothing comes cheap and that is why everyone wants to have a good job. It is certainly not easy to explain what exactly unemployment is, but when trying to understand, it is important to keep in mind that the work force of a country does not pertain to just any and everyone who wants to have a job. It pertains to those individuals who not children or not retired. In addition to this it does not include also, people who are physically or even mentally challenged. There are many individuals who have a faulty understanding of what unemployment is and forget to eliminate those individuals who have been mentioned above. 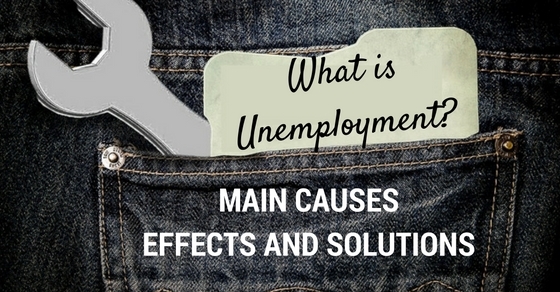 Now let us look at the main causes, effects and factors of unemployment. Of all the many causes of unemployment which exist, the main causes of unemployment can be pointed to the global economic crisis which exists at the moment and has existed for a while. This economic crisis has effected in a very negative manner, the trade between countries. Countries which were previously rather rich have not been able to withstand the economic crisis. In order to avoid any kinds of major losses, companies too have begun to decrease the production of their goods, since not many individuals are willing to invest a lot of money in purchasing things. The following mentioned are few major causes of unemployment. It is very needless to say that today we live in an age of technology. Previously companies required a lot of labor in order to perform tasks for them. However nowadays, computers and various other machines can perform even the most complex of tasks in a matter of minutes. In addition to that, some years ago, even sending one message or reply took so much of time. Nowadays with the help of the internet, things are done in the matter of minutes and it is for this reason that so many people are no longer required to do tasks which required manual labor and intellectual ability. This is one of the reason of unemployment. Big companies provide their employees with a large number of benefits and facilities. It is for this reason that when looking for employees, they have a large number of specifications. Unless a person fulfills all the requirements, he or she will not even be considered for the position at hand. Since job descriptions have become so very specific and particular, people are finding it very tough to even get an interview. At such a point in time there is little which can be done, because companies will not be willing to take on board those who are not exactly perfect for the job. Previously top companies hired a large number of people so as to ensure that all the jobs get done in a proper manner, within the stipulated deadline. However nowadays, companies prefer to hire as few people as possible on board. This is so that they do not have to spend too much money on salaries and secondly so that their trade secrets do not go out. They are only willing to hire those people who they trust and are entirely sure of. Many bosses believe that hiring 5 competent people on board is better than having 20 average people. Offices only hire rockstar employees who are all rounders and are capable of excellent work at all times. There are many individuals out there who are very specific when it comes to choosing jobs, simply because they do not work in a company which they would not like to mention on their CV, in the future. On the other end of the spectrum, there are those individuals who are willing to take up any job as long as they are getting a salary and job. The first kind of people prefer to wait for the right job to come along and that is why they end up being unemployed. They too want to be employed but they are unwilling to take up simply any and every job which happens to come their way. Till a few years ago, the literacy rate the world over was not very high at all. However nowadays more and more people from even the rural regions are coming forward in order to receive an education. In addition to this even women are being encouraged to come forward and study so that their future is bright and promising. It is very sad indeed that because so many people are educated, the number of jobs are falling short and that is why there is so much of unemployment especially in big cities. Once people are well educated, chances are that they will be unwilling to accept a job which is not worthy of their intellect. In certain places job opportunities are more than others. Some places are just not developed enough to provide jobs to a large number of people. The immobility of the work or labor force is one major reason for unemployment as well. For various reasons certain able people are simply unwilling to migrate from one location to the next. Rather than taking the plunge, they prefer to remain close to home and families as well. Doing this is something which is not very wise simply because if you realize that your current location does not hold much potential for you and your career, you must be willing to relocate. It is rather interesting to note that the global economic crisis is not merely a cause but also an effect of unemployment. Once people are unemployed the government of a country becomes responsible for providing the people with amenities and facilities which they cannot afford. So when so many people of a country are unemployed it automatically results in recession. Once people are unemployed they are naturally unwilling to have any purchasing power. However besides the unemployed, even those who are employed are unwilling to spend a lot of money, simply because they fear that if things get worse and the company closes down they too might end up losing their jobs. In addition to affecting the country and society it also negatively effects the individual who begins to second guess all his decisions as well as his personal worth at such a time. When someone in the family is unemployed, it is usually not just that one person but the entire family which is affected and has to suffer. In addition to money being scarce in the family, the family also has to cater to the emotional needs of the person who is unemployed. Of all the negative effects of unemployment, one of the worst effects is that it leads to an increase in crime in the country. When bread winners in a family are unable to provide for their loved ones, they have no option but to resort to crime as well as fowl means in order to feed their family members. At such a time when people are unable to keep body and soul together, their conscience seizes to function and they do what seems correct to them at the moment as well as under the given circumstances. It is often said that desperate times call for desperate measures and that is the motto which such people choose to live by. The work force of any country usually makes up a large part of its population. In order to cater to the needs of its people, all countries should ensure that they create many job opportunities so that all the people who are eager to work, get the chance to do so. This having been said the government should ensure that people are paid adequately for the services which they provide so that at the end of the day, no person feels like he or she is being over worked and paid less. Once more job opportunities are created the unemployment rate is sure to come down a great deal. Many of us would know that from a very young age, we are made to choose from very specific job options. Most often than not, our parents encourage us from a very tender age to become either doctors or lawyers or are encouraged to dream big. It is for this very reason that from a very young age kids should be encouraged to broaden their horizons. Not everyone needs to be a doctor, lawyer or a part of the corporate jungle. There are plenty of lucrative opportunities available for individuals in other fields as well. It is rather unfortunate that so many able and capable people are unable to find jobs, simply because there are not many opportunities available for them. Big and successful companies nowadays simply want to hire the best of the best. No big corporate house is willing to hire individuals who are unsure of what to do in a professional set up. Being unemployed causes people to often feel sad as well as depressed, so if you have some family member or friend who is unemployed ensure that you are there for this person in their time of need and self doubt as well.